Phillies fans in Penn Manor and all around the country had a wide range of emotions Monday when the Phils stuck it out to beat the Yankees 8-6. They felt happy when they saw second-baseman, Chase Utley, hit two home runs again in one game and when the Phillies shot up their lead to six runs. But then they saw the Yankees rally once again with in the ninth to almost come back. However, their run went over a speed bump when “El Capitan”, Derek Jeter, grounded into a double play. The Yankees gave another scare to Phillies fans when they almost rallied, but then Phils’ fans were able to breath a sigh of relief when their relief pitcher, Ryan Madsen, ended the game. Phillies’ fans don’t have time to feel relieved as they are going back to Yankee Stadium to try to keep their season alive. Although mostly Phillies’ fans are in Penn Manor, the Bronx Bombers have a lot of supporters in these halls as well. “It’s easy to be a Yankee fan in that they win,” said Sean McKnight, one of the big Yankees’ fans of Penn Manor. Even though students that are not fans of the Yankees might jeer his team, the tech teacher doesn’t keep his allegiance a secret. 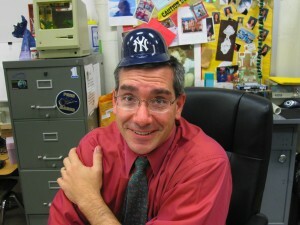 In fact, in his class, normally you wouldn’t be allowed to wear a hat, but if it’s a Yankees’ hat, you can wear it. Not only that, McKnight and a fellow teacher, Gary Luft, are having a little bet of their own. If the Yankees win, Mr. Luft, who’s a Phillies’ fan, has to wear a Yankees’ shirt and tie the next day, but if the Phillies win, McKnight has to wear a Phillies’ shirt and tie. McKnight doesn’t mind being around a bunch of Phillies’ fans because he likes to joke around back and forth with the students. “It’s going to be a really tight series,” said McKnight about the World Series. McKnight isn’t the only Yankees’ fan teaching here. Other teachers including Cynthia Lonergan (Social Studies), Scott Lackey (Phys. Ed. ), and Katherine Lombardi (Foreign Language) are in the lonely group of Yankees’ fan teachers surrounded by the other Phillies’ fan teachers like Matthew Scheuing, Gary Luft, and more. Sean McKnight wears his favorite team's mini baseball helmet. But why be a Yankee fan in south-central Pennsylvania? McKnight said he was a Yankees’ fan because his brother used to play little league baseball and the team was called the Yankees. That year, McKnight became curious about the real big league Yanks. That year, Jackie Robinson went wild with home runs and good numbers. His uniform number was 44. Guess what McKnight’s brother’s number was? Yep, 44. So McKnight started watching them and came to like them more and more as time went on. Lonergan was living in New York before she came to Pennsylvania to attend college and teach; Lackey was a Yankees’ fan ever since he’s been old enough to play baseball. He started liking them because players like Reggie Jackson and Ron Guidry were fun to watch; also, Lombardi’s father lived in Brooklyn, New York and all of her family members are Yankees’ fans so it rubbed off on her. Both Yankees’ and Phillies’ fans, are expecting a tight series and most people are saying the series might go 6-7 games. In a poll of about 50-60 people, the average who voted for the Phillies who they like/think is going to win was 61% then leaving the Yankees percent at 39. Not surprisingly so, the Phillies’ fans outnumbered the Yankee’s’ fans. 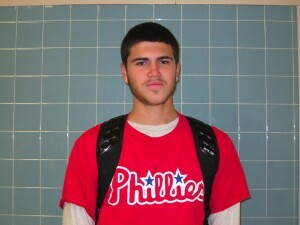 Arguably the biggest Phillies’ fan in the school, Wes Rowe, thought the Phils were going to win in 6 games. Mark Curtin, who is a Yankees’ fan, thinks the Yanks are going to win in 6. Kyle Harvey, a senior who is pulling for the Yankees, thinks they’re going to win in 7. Another big Phillies’ fan in Penn Manor, Bryan Hess, a junior, thought the Phillies would get their second World Series in a row in just 4 games with the help of Carlos Ruiz, or “Chooch”, as he calls him. He also had this to say about Yankees’ fans in Penn Manor. Philadelphia, led by ace, Cliff Lee and big bat, Ryan Howard, will continue to have most of Penn Manor’s support while they try and catch up to the Yanks. Will the Phillies make most of Penn Manor happy, or will the Yankees end their hopes for their second World Series in a row led by Alex Rodriguez, arguably the hottest hitter in the playoffs right now, and ALCS MVP CC Sabathia? The Yankees gained a bigger lead, 3-1, on Sunday as they scored three runs off of Phillies’ closer, Brad Lidge, to win game 4 7-4. If you want to watch these tight remaining game(s), the remaining game(s) will be on as follows: (Note all game(s) are on FOX and the ones with an * are if necessary) The Series is returning to the new Yankee Stadium on Wednesday at 7:57 p.m. as the probables of Andy Pettite, the all-time winningest pitcher in the playoffs, and Pedro Matinez, who got ripped apart by the Yankee Stadium crowd in game 2 of the World Series, go up against each other, and *Thursday at 7:57 p.m. where CC Sabathia would go up against Cole Hamels, J.A. Happ, or even Cliff Lee on only two days rest but that would be doubtful. “Someone is going to win and someone is going to lose,” said McKnight about this year’s World Series. The Phillies, with most of Penn Manor by their side, will try and extend the Series and their season as they go from being comfortable – or maybe a little less because one loss and they’re out – in their own stadium to the tough to play in, Yankee Stadium. Will the hanging by a thread Phillies extend their hopes to game seven? Or will the Yankees end the Phillies’ season on Thursday? I guess we’ll just have to watch and find out. The Phillies would have done better if it wasn’t for Cole Hammels getting dominated this series.